This Series is being dicontinued. Please see the LC602 Series or LCDA Series as a possible substitute, or contact our sales/engineering department. The LCDB single-ended beam-type load cell is constructed as a bending beam for 200 lb or less, and as a shear beam for above 200 lbs. 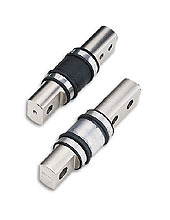 Its high accuracy, low profile, and redundant sealing make it well-suited for use in small and medium platform scales and process applications in harsh environments.